Get and put playlists online. Exchange them with your friends all the world! There was a computer born in 1982. He was named Commodore 64. First time called 'Personal Computer', later 'Home Computer'. Thousands of creative guys and girls were fascinated by the possibilities of his hardware. So most users played games, less of them created programs, sounds, musics, pictures. There was at the end (is there an end?) around 30000 programs. Most of them have music inside. Since the 1990er years the 80x86 processor developmented quicker, faster, usefuller... By this way, more and more users of C-64 changed the system to 'normal' PCs. But my work at C64? It was too bad to through it all into trash and forgot the hard work like composing music. Very great Music composed at C=64 since 1982. Also there were much guys who 'ripped' the musics out of the Games, Tools, etc. and transfered into a PC-readable format: SID. There some collections of C64-Musics, but the biggest of them is the 'High Voltage Sid Collection' (HVSC) with now more than 35000 SID-Files. Much of this files have more than one Music but the file is very small (most less than 5kB), but plays 2 or more minutes fine 3-channel-mono-sound. The collection have a size of ~230 MB. How to find good musics in 35000 files? How to read the documents of HVSC? Who are the authors of SID-Musix? 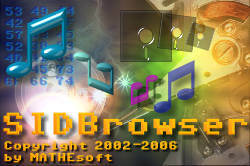 Since 15th of May 2002 there is a easy way to browse in the HVSC, to read the documents, see the authors, get more Information, create playlists, manage own sids on harddisk (without switch on the c64 and swapping floppies to listen the favourite musics). It is important at Windows Vista® NOT install SB at "c:\program files"
There are 35000+ SID in more than 68MB (2*zip) or 50MB (rar). use it on e.g. 512MB-USB-Flashram-drive. SIDBrowser now prepared to run at mobile Flashdrive! !! Services are offline, but will continue soon... !! (zip, 380'671 Bytes; "June 2 version (2005)") - if you want. It is included too. It is size-reduced version with upx and UPack. if you interesting about the future of SB. Martens damage your car or house?